At Bitsy’s, we’re on a mission to make great food that starts with a simple belief – healthy bodies and healthy minds are connected, and learning to eat smart should be fun. Every day, we work to make mega-delicious, ultra-nutritious foods for your kids and our own, to nurture their bodies, minds and imaginations and to inspire them to learn and grow. This is the story of two friends who went to the grocery store to shop for their kids. It turned out the healthy aisle was no fun—and the fun aisle wasn’t healthy. So they decided to create products for all kids that are just right (thus wiping out endless hours of negotiation and bringing peace to weary parents and children, ending food fights waged around the world). Before we were moms, we spent a lot of years working with kids and schools, studying child development and education. Together, we built nationally recognized programs that empower young people to live healthy, successful lives. One of the biggest issues we saw affecting kids was the growing epidemic of childhood obesity. LIGHT BULB. Wouldn’t it be better, we thought, if instead of teaching kids how NOT to make the wrong choices, we made it a little easier for them to make the right ones? Let’s get kids excited to CHOOSE healthy! Then we became moms and said, SOMEONE had better do this. And no one did. So… here we are. Making healthy fun! Boom. We even decided to ante up and be honest with the kids. Yes, Virginia: there are fruits and vegetables in your brightly colored, character covered pouch. Because the fact is – certain foods are smarter than others, and kids are smart, too. So we’re not feeding them carrots then calling it car-amel. Carrots are cool. You dig? Click HERE to view nutritional content. Bitsy's Brainfood Smart Cookies are so delicious! My kids and I love them! I love that they are alphabet shape so my kids can try to spell words with them and learn while eating a yummy healthy treat. As a homeschooling mom I really appreciate anything that makes learning fun. This is the perfect afternoon snack for my kids and to be honest I often snack on them too! I love the flavor of them all but my favorite is the sweet potato oatmeal cookies. They taste just like oatmeal cookies and you'd never even guess that they contain sweet potato. That's how all Bitsy's Brainfood Smart Cookies are. You cannot taste the veggies, just the yummy flavors of cookie's most of us love. 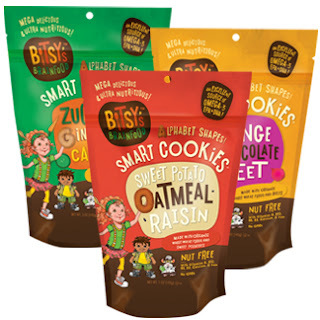 Bitsy's Brainfood Smart Cookies are made with real fruits and veggies and are and excellent source of vitamins and minerals. What a great way to add veggies to your kids diet! Click HERE to locate in a store near you!